Submitted by Cory, this article belong to the Poker Strategy series. 3 betting in poker by Cory the lead singer in corywilkinsband.com. Poker goes through cycles and evolutions and the current state of no limit focuses a lot on pre-flop action. Whether it’s tournaments with short stacks and fast blinds, or four bet bluffing 300BBS deep in a cash game how you’re playing pre-flop, notice I said, “how,” not, “what,” is going to set up your story for the rest of the hand. Right now, I just want to talk about 3 betting. I know a lot of people watch shows like High Stakes Poker and just can’t figure out why Durrrr is 3 betting with Ten 7 off suit. There is a rhyme and reason for different 3 betting strategies and the most important factors are stack size, position and opponent. Let’s talk first about stack size. If you’re 100BBS deep or less, your 3 betting range is going to include the top of your range, AA, KK, QQ, JJ as well as the middle of your range, hands like 88 and KQO. When you’re deeper stacked, hands in the middle of your range become great implied odds hands, so you may not want to 3 bet them as often. If you and your opponent are 200BBS deep, why 3 bet 88 pre-flop? If you’re 15BBS deep, your shipping it. Many people don’t account enough for stack sizes. The problem with 3 betting a hand like 88 when we’re 200BBS deep is what do I do when I get 4 bet? I have way more to gain and far less to lose by just calling a raise with a strong implied odds hand than I do by possibly getting 4 bet off of it or risk getting way too much money in the middle in a marginal spot. However, when I’m deep I’ll need to polarize my 3 betting range so my opponents don’t know whether I have aces or not. I’ve found that good hands to do this with are hands that I can throw away easily when I’m 4 bet, I can easily continuation bet and fold to a raise on the flop if I need to and when I do go to showdown I help my image be a little more crazy by showing that I 3 bet with jack 8. Your next factor is position. You’ll need a slightly different range based on your position. I tend to three bet hands like AK, AQ, TT and 99 more often out of position than I do in position. The two main factors I’ll need going to the flop are position and initiative. Since I can’t have position, I’ll take the initiative and be the last aggressor pre-flop. Also, sometimes my opponent will fold and I’ll take down the hand without any post-flop decisions. By taking the lead with a 3 bet, I’m trying to negate my positional disadvantage as much as I can. I can now continuation bet a lot more flops successfully since people play far more straightforward in 3 bet pots than they do in 2 bet pots. If I just flat with Tens out of position and the flop comes Q, 8, 3, now what do I do? Donk bet? Check raise? If I check raise, what do I do on the turn if my opponent calls? Now the pot is getting huge and he could easily have a hand like AQ or KQ or QQ for that matter. 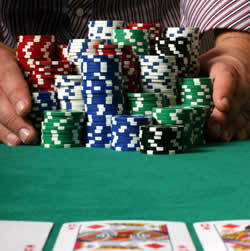 If I put in a reraise pre-flop the action might look like this. Opponent opens from LP for 3X. I reraise from SB to 9X with TT. BB folds and original raiser calls. Flop is Q, 8, 3 rainbow with 19BBS in the pot. I’ll bet about 2/3 pot or 12BBS and generally take down a nice pot and my opponent’s range is much better defined if he should call. The other huge upshot in this example is I was able to get the pot heads up and create dead money which is the best kind to have in the middle. If I had just flatted with my tens, the hand may look like this. Opponent opens from LP to 3X. I call from the SB and the BB calls making a pot of 9X going to the flop. Flop is Q, 8, 3 rainbow, I check and BB checks. The original raiser makes it 2/3 pot or 6BBS to go and I raise to see where I’m at and get value against hands that I still beat. I’m going to have to raise to at least 15X here which should fold out the BB. The original raiser calls. Now the pot is 39BBS and I’m just realizing that I might be in a lot of trouble. Do I lead the turn hoping he’ll fold? That’ll need to be a pretty substantial bet now. At least 25X. Now I’ve got 43X in there and have no idea what’s going on. Do I check the turn and let him just fire away? Yes my opponent is betting queens here, but if he’s tricky he might have seen through my flop check raise and have floated the flop to fire at the turn. Also keep in mind, I picked about the driest board possible for this example. This hand just got pretty complicated without a flush draw or straight draw. The final consideration is who I’m up against. I want to 3 bet players that open with a wide range and it’s even better if they tend to fold sometimes. If I’m against someone who goes to showdown a lot I’ll need to 3 bet more on the top end of my range because though I may be ahead of his opening range I might be in trouble against his showdown range and he’s not folding enough to make it worth it. Unless you’re more of a smallball player, you need to work on your situational 3 betting. It will help establish you as the table captain and will get you tons of action because your opponents won’t remember the times you 3 bet with AA because they would 3 bet with AA. However, they’ll remember when you 3 bet with K9 because they’ll think you’re crazy and put you on air more frequently than they should. To help you get more aggressive, play a bit of 6 max. Good luck and happy reraising.